And the best sort of electronic music events are those curated by electronic music enthusiasts, people who actually enthuse about the genre, recognise its history and expel a passion to see it continue as a defined artform. 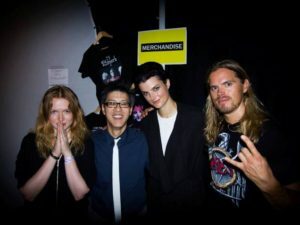 Two such people are Henrik Wittgren and Sebastian Hess, whose organisation Depeche Mode Party Gothenburg have been running successful music events in the Swedish city for several years. 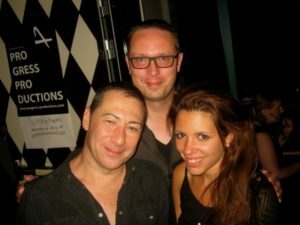 Electronic Summer started as a DEPECHE MODE fan event in 2012 with none other than Alan Wilder as guest of honour, while the live headliners were MESH and DE/VISION. 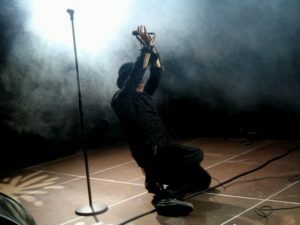 Since then, the event has developed with DAF and APOPTYGMA BERZERK headlining in 2013, while the 2014 event featured COVENANT, ASSEMBLAGE 23 and AESTHETIC PERFECTION. With VNV NATION, SOLAR FAKE, MARSHEAUX, KARIN PARK and PYSCHE featuring in the Electronic Summer 2015 line-up, a sell-out crowd at the Brewhouse Arena was eagerly anticipating a great weekend of music and culture. Such was the community spirit of the occasion that musicians from local acts such as TRAIN TO SPAIN were also in attendance. To start proceedings, early arrivals were welcomed to an enjoyable pre-party featuring AVANTGARDE, XHILE, PRESENCE OF MIND and DESTIN FRAGILE. 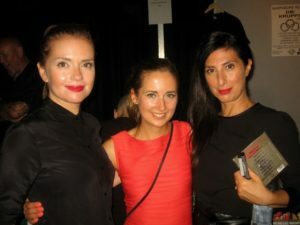 Each act had appeared on the cult Swedish synthpop compilation ‘Circuit One’ and gathered to celebrate its 20th anniversary. PRESENCE OF MIND were particularly impressive with their brand of dark, but melodic synthrock. Their debut album ‘Interpersonal’ was only released in 2014, but it is a indicator as to why Swedish acts are generally holding their own against competition from around the world. Meanwhile, DESTIN FRAGILE showcased songs from their ‘Halfway To Nowhere’ album released this year and some observers have considered it one of the best synth flavoured long players of 2015. Day 1 began in the late afternoon with Nordic friendly blog Cold War Night Life hosting a DJ set in The Outsider bar area. As music fans prepared themselves for a nine hour night, DJ combo Spacelab aka Alexander Hofman and Johan Billing from S.P.O.C.K. continued the electronic soundtrack. Throughout the weekend, there were enjoyable DJ sets based around the themes of Mute, DEPECHE MODE, NITZER EBB and ERASURE but there was also just great electronic pop by artists of all generations ranging from KRAFTWERK, SOFT CELL and NEW ORDER to CLUB8, TRUST and SUSANNE SUNDFØR. 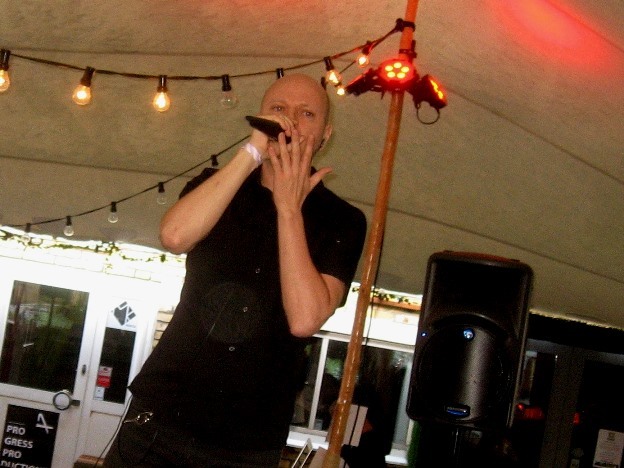 The first live act of the day was the milk loving PETER SJÖHOLM who gave his distinctive quirky take on electronic pop. But that was followed by the unusual sight of Day 2 headliners VNV NATION taking to the stage at 19:00 hours. Performing what was billed as an alternative set, it contained a collection of their lesser played works from their vast catalogue like ‘Kingdom’ and was a suitable dress rehearsal for their headline slot. 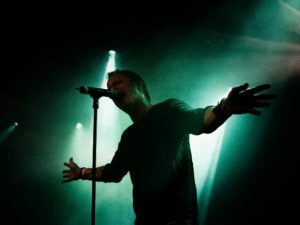 Following on, NATTSKIFTET and VIRTUAL VOICES kept the crowds warm in preparation for Canadian darkwave trailblazers PSYCHE. Accompanied by Stefan Rabura, Darrin Huss led a spirited performance that was fittingly poignant following the recent sad passing of his brother and PSYCHE founder member Stephen. This was particularly evident on ‘The Brain Collapses’ from ‘Insomnia Theatre’, their debut album together. The magnificent ‘The Saint Became A Lush’ from ‘Unveiling The Secret’ was another pivotal moment while that album’s title track and the single ‘Uncivilized’ were other treats. Huss recited his synthpop knowledge too, dropping in snatches of EURYTHMICS’ ‘Sweet Dreams’ and YAZOO’s ‘Bring Your Love Down (Didn’t I)’ during the set. KARIN PARK gave another of her towering performances, the aggressive synth glam of ‘Look What You’ve Done’ fully exploiting the presence of her metalhead drummer brother David and lively new keyboardist Kine Sandbæk Jensen aka PIECES OF JUNO. Meanwhile ‘Stick To The Lie’ and ‘Ashes’ demonstrated that despite her intense stage demeanour, Miss Park does supreme electronic pop. To climax the set, the charismatic Swede led a three way drum barrage to conclude the mighty ‘Thousand Loaded Guns’. PROJECT PITCHFORK concluded the evening with a suitably Teutonic fist of aggression; their in-yer-face pounding ensured any remaining energy left in the audience after a long day was put to efficient use. If nothing, it ensured a good night’s sleep in preparation for Electronic Summer 2015’s second instalment. Day 2 began with HILTIPOP, the solo project of Magnus Johansson from the YAZOO influenced duo ALISON. His promising FAD GADGET meets KRAFTWERK template was an ideal way to ease everyone back into the synthetic groove and many watching including George Geranios of Undo Records and Darrin Huss were impressed. 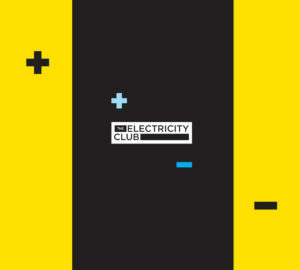 Following on, STURM CAFÉ gave their localised take on electro body music. With enough flashes of DAF to wake anyone who was still sleepy, the Alte Schule sound was not totally unexpected from a band who soundtracked a movie called ‘Die Zombiejäger’. Meanwhile, ME THE TIGER were another Swedish band on the second day’s very international bill and notably reflected their country’s solidarity values. With their synth assisted new wave songs like ‘Ariana’ and ‘Pocket Sized Edition Ending’, the trio showcased their YEAH YEAH YEAHS influenced pop augmented by punky guitars and lively drums. 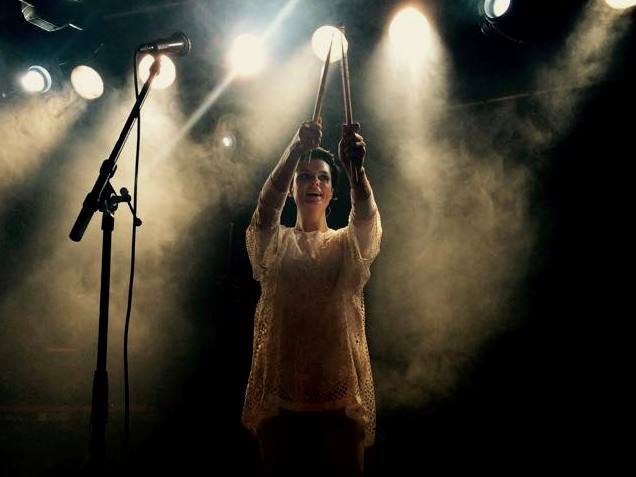 In Gabriella Åström, ME THE TIGER have a feisty front woman full of energy and attitude, something that was particularly evident on anthemic numbers like ‘Heartbeats’ and ‘What Promises Are Worth’. Even a broken kick pedal didn’t dampen their enthusiasm and this was promptly repaired without a flutter. 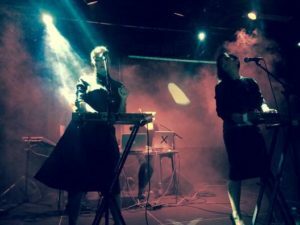 The event maintained its original DEPECHE MODE roots with the presence of Athens based synth maidens MARSHEAUX performing selections from their acclaimed reinterpretation of ‘A Broken Frame’. The wispy renditions of ‘My Secret Garden’, ‘Monument’ and ‘Leave In Silence’ were particular highlights while there was the surprise inclusion of ‘See You’ B-side ‘Now This Is Fun’. Best of of all though was an angelic rendition of ‘The Sun & The Rainfall’. 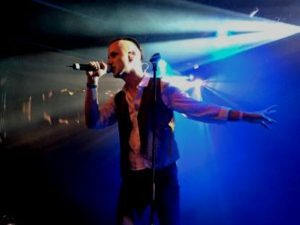 But it wasn’t all about Basildon as MARSHEAUX impressed the Devotee dominant crowd with their own cracking tunes like ‘Hanging On’, ‘Dream Of A Disco’, ‘Come On Now’ and ‘Breakthrough’. German duo SOLAR FAKE led by Sven Friedrich kept the crowd moving with their Goth infused electro, a tone that was not entirely surprising given Friedrich’s roots in cult alternative band DREADFUL SHADOWS. ‘I Hate You More Than My Life’ was a more than ideal overture while ‘Under Control’ provided a trancey focal point with hints of COVENANT. 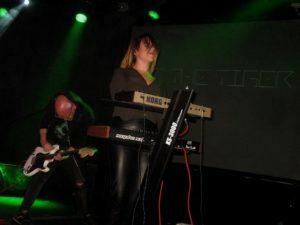 The remainder of their set was enjoyably accessible dark synthpop that suited the duo’s striking look. 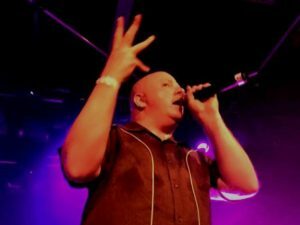 To conclude the weekend, VNV NATION blasted their way through a hits set of their characteristic Futurepop, the duo of Ronan Harris and Mark Jackson certainly providing lashings of “Victory Not Vengeance”. 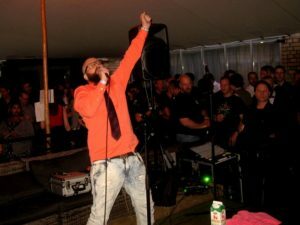 2011’s ‘Space & Time’ and the 1999 vintage of ‘Standing’ were just two of the stomping crowd pleasers while the more epic electro rock inclined ‘Perpetual’ made a fitting set closer. Throughout the weekend, there was an enormously warm and friendly atmosphere. The event had something for everyone so as different factions of the audience moved between their preferred acts, there was plenty of time for passionate discussion in the various bars. 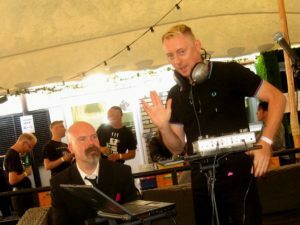 Despite fierce debate about the merits of synthpop versus industrial, most shared an intense dislike of EDM and agreed that its inane DJ culture was ruining electronic music. However, when there were differences in opinion as the well-known Nordic enjoyment for liquid refreshment kicked in, no-one took it personally. There was plenty of mutual laughter as chat varied from whether ‘MG’ was actually a Eurorack YouTube tutorial put to record, to the use of the word ‘Marmite’ as a descriptive term in music journalism. Electronic Summer has developed into a fine annual platform showcasing the best in independent synth driven talent from around the world. 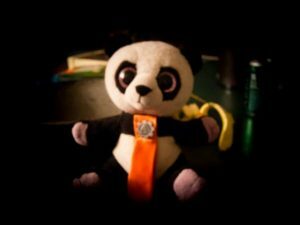 The 2015 variant was a truly worldwide event, again proving what can be done when event organisers actually enjoy and understand the music they are dealing in. It was indeed, a fine benchmark for other event organisers to aspire to.